The November Edition of the Washington E-Bulletin is now available. This month, we give thanks to all of the volunteers who help promote AALL’s policy agenda, provide you with an update on the latest news from the Hill, describe President-elect Barack Obama’s support for transparency, and summarize a couple of recent chapter programs. -Great New Regulatory Resource for Law Librarians! In the most recent edition of the AALL E-newsletter, From the Desk of James E. Duggan, AALL President James Duggan announced some exciting changes for the Washington Affairs Office. First, at its fall meeting, the Executive Board agreed to change the name of the AALL Washington Affairs Office to the AALL Government Relations Office to better reflect the broad scope of our work, which covers federal, state, local, and international issues. In addition, Mary Alice Baish was named director of the Government Relations Office. Over the next several months, we’ll be updating our Web site and the Blawg to reflect these changes. We appreciate your patience during this process! Please note that on the Blawg, you’ll now find all entries previously placed in the “Washington Affairs Office” category in a new category, “Government Relations Office,” along with more recent entries. Blawg posts through October 2008 are still available through the “Washington Affairs Office” category. Change.gov, the Obama-Biden Transition homepage, is filled with information about the President-elect and Vice President-elect Biden, their agenda, the Transition team, and more. Protect the Openness of the Internet: Support the principle of network neutrality to preserve the benefits of open competition on the Internet. Open Up Government to its Citizens: Use cutting-edge technologies to create a new level of transparency, accountability, and participation for America’s citizens. Bring Government into the 21st Century: Use technology to reform government and improve the exchange of information between the federal government and citizens while ensuring the security of our networks. Appoint the nation’s first Chief Technology Officer (CTO) to ensure the safety of our networks and lead an interagency effort, working with chief technology and chief information officers of each of the federal agencies, to ensure that they use best-in-class technologies and share best practices. AALL has been advocating for these issues through transition recommendations and support for legislation, and we are pleased to see these open government principles and support for transparency outlined on the Transition Web site. Yesterday, November 12, 2008, OMB Watch released the 21st Century Right to Know Project’s Transparency Recommendations to President-elect Barack Obama and key members of Congress. The recommendations are included in a report titled Moving Toward a 21st Century Right-to-Know Agenda: Recommendations to President-elect Obama and Congress. The 21st Century Right to Know Project developed these recommendations with the help of a diverse set of organizations and individuals, including AALL and many law librarians. AALL has signed on to endorse the recommendations. Last month, we called on law librarians to take action and endorse the Transparency Recommendations. An impressive number of you heeded our call! Seventy-five individual law librarians and eight AALL chapters, including GPLLA, LLOPS, NOCALL, SANDALL, SCALL, SFALL, SNELLA, and WestPac, signed on. AALL’s Government Relations Committee and AALL’s Technical Services Special Interest Section also signed on. Thank you all! For those of you who haven’t signed on, it’s not too late! OMB Watch is still accepting endorsements. We invite you to read the recommendations and join the more than 240 organizations and individuals by signing on to endorse the recommendations. This is your opportunity to show President-elect Barack Obama and the 111th Congress that access to information and government transparency are important issues to you! The U.S. Government Accountability Office (GAO) has developed a Web site to provide information about the 2009 Congressional and Presidential Transition. On this Web site, GAO provides background information, recommendations, and links to additional research on what it has identified as the nation’s key issues and challenges. Each category provides background information, recommendations (called What Needs to Be Done), links to Key Reports, and a video message from a GAO expert. As we transition to a new Congress and administration, this is a terrific place to turn for substantive information on key issues. 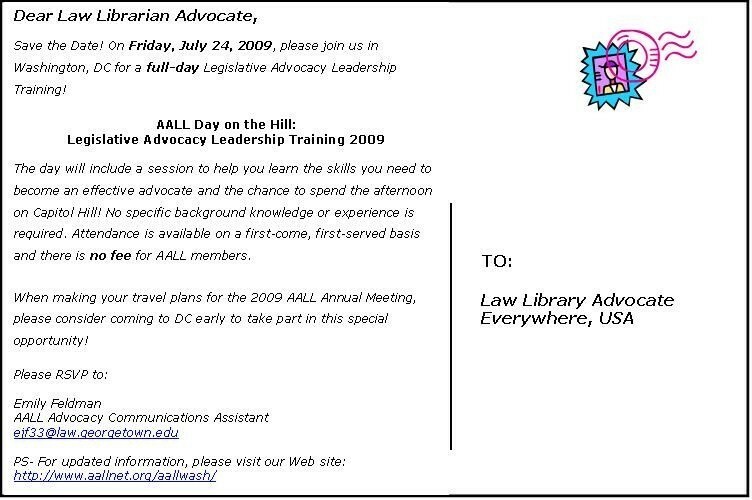 Save the Date: Full-Day Advocacy Training 2009! This year, in addition to learning the skills you need to become an effective advocate, you will have an opportunity to spend the afternoon on Capitol Hill! Please click on the virtual postcard below for a special message and more information. Please consider coming to DC early so that you can take advantage of this opportunity! If you plan to attend the Advocacy Training, please RSVP to me, Emily Feldman, Advocacy Communications Assistant for AALL. We look forward to spending the day with you in DC! You are currently browsing the AALL's Washington Blawg blog archives for November, 2008.